Nobody likes to admit that their project is not running smoothly. But even though project managers hardly ever talk about it, there are plenty of projects that are in a stalemate, that do not deliver any results and that eventually fizzle out. In case of an acute project crisis, managers are immediately alerted – but the gradual decline of a project often remains unnoticed until it is (almost) too late to save the project. There are many reasons why a project slowly languishes. Maybe the people in charge got it wrong from the very beginning – but this insight is not very helpful at that point. Project managers, however, should rather find honest answers to the following questions and find out whether and how to put the project back on a successful track. Does the project still make sense? This question should be the starting point of all considerations. Only if it is still relevant for the company to achieve the project’s original goals, it makes sense to make an effort to reinvigorate the project. It is also highly important to know whether the project still gets the necessary back-up from managers, team members and stakeholders inside and outside the company. Maybe it was just a prestige project of a single person who wanted to make his or her mark, but who has left the company in the meantime. If the project cannot create any added value it might be better to give it up before any more resources are squandered. What about the basic requirements of the project? Maybe, the project cannot be promoted, because important pre-conditions for project success have not been created. It might be that the project budget is insufficient or that there are not enough resources allocated to the project. Perhaps the time planning has been unrealistic from the start. All sides of the magical project triangle (time, budget and quality) have to be scrutinized. Does the project have to fall short because of urgent tasks in the line? It might also be possible that all team members find the project relevant and useful indeed, but that they have to keep postponing their project tasks for urgent tasks of day-to-day business. The best resource planning is useless if the team members’ additional calendar appointments and obligations are not taken into consideration. In such cases, either the project plan has to be adapted to the additional obligations or the project team members’ workload in day-to-day business has to be reduced. Does the project team communicate enough? “Oh, if I had only known earlier…“ – If you keep hearing this in your project team, your project is probably in no good condition. A lack of communication is considered to be the main reason for project failure. This is on the one hand about substantial organizational questions (Who does what when? Which work packages have already been completed? Which version of the project documents is the latest?). It might be pretty useful to automate this type of communication to a certain degree to avoid the manual distribution of each piece of new information. Software for project management provides good service in this case. On the other hand, communication is also an important executive function. Only if the team members know about the main purpose of the project and its goals and if they consider their own contribution to it as relevant they will work with a high level of motivation for project success. Is there a permanent quarrel in your team? If projects don’t go well, managers mostly stick to the hard facts: Has the budget been exceeded, did the team miss important deadlines, have tasks not been completed? Managers often forget to check if the chemistry in the team is good. If there are permanent quarrels and conflicts in the team, the team members won’t be willing to act in concert. You should sit up and take notice if team members keep arguing or if there is an increase in employee turnover. These are often alarm signals for far reaching project problems that produce stress and frustration. 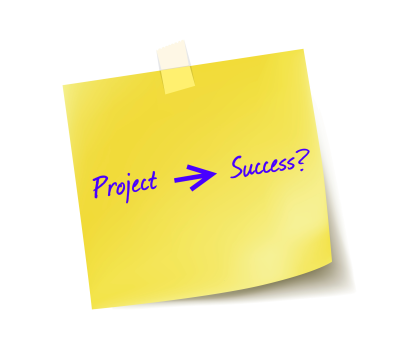 Have you agreed upon binding project goals and stages? Often, deficits in the project remain unnoticed for quite some time, because no one has ever defined important milestones and, consequently, no one can control if these milestones have been met. Without deadlines and milestones, team members don’t have an incentive to complete their tasks in due time. At the very latest, however, when there hasn’t been any noticeable progress in the project for some time, it is time to create a detailed project schedule with responsibilities and due dates. Only if you manage to establish liability, people in charge can see when intermediate results become due and you don’t have to rely on the team members saying that they’re “almost done”. To bring your project back on track, you should follow three steps: First, you have to make sure that the company still needs the project. If this is the case, the team has to be filled with enthusiasm for the project again – good communication, good chemistry and sufficient resources establish a good basis for success. All team members also have to commit themselves to deliver results reliably and in due time – then your project can regain momentum. When Projects Have Stalled - The Most Important SOS Measures - InLoox • Copyright 1999-2019 © InLoox, Inc. All rights reserved.